Twitizer enables you to send long messages, images, videos or audio from your mobile phone or PC, optionally via Twitizer Uploader for Android, and get them published as tweets on Twitter, making the Twitter experience much more fun and expressive. Go beyond text tweeting at your favorite artist’s concert, your family vacation on the beach, your bachelor party, your wedding, your vacation trip, your child’s birthday, etc etc. Twitizer provides a simple and secure API that enables other applications to use Twitizer for storing multimedia files in relation to Twitter updates. The API Specification describes how it works. The functionality described in the specification is ready to use, but requires a customer-specific API key that is requested from Abiro. The API is used by Twitizer Uploader for Android. Twitizer can be licensed as a whole by companies that want to provide a general media sharing service complementing e.g. Web magazines and forums, as well as a stand-alone service. Re-branding, customization, integration, hosting, complementing mobile applications etc can be provided by Abiro on request. 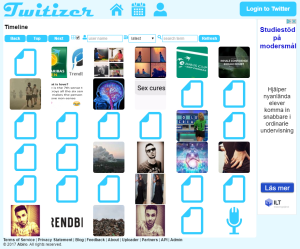 Twitizer was specified and implemented by Abiro during 2009, but has been improved over time. Twitizer is no longer active.